We offer Quad biking Adventures in Paarl. Go riding on a working wine farm with different trips and package to choose from. Fun and beautiful views await you. This quad biking venue is near Stellenbosch in the Paarl area. 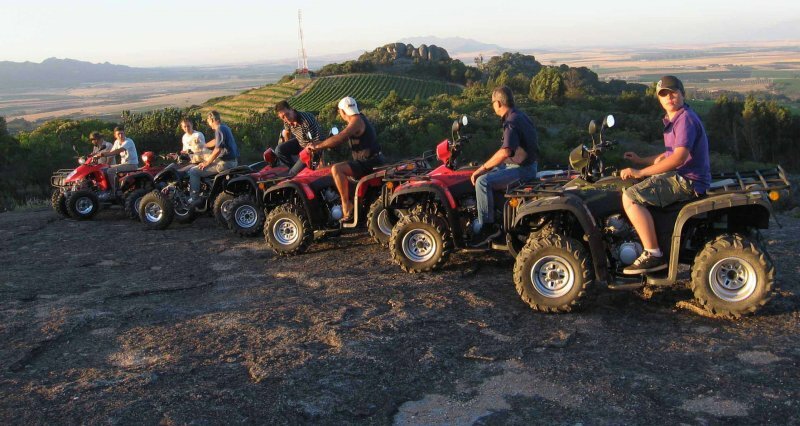 Based on the beautiful Rhebokskloof Wine Estate in Paarl, South Africa, the quad bikes complement the horse trails, by allowing guests to enjoy the same views and nature experience, as the horse riders do. Like the horse trails, the quad bikes are led by an experienced guide. Trails: There are half hour to 2 hour trails. There is also a fun obstacle course through the forest, which gives novice riders the opportunity to practice their new skills. The trails operate 7 days a week, but booking is essential. ONE HOUR NATURE TRAIL: – A trail through the vineyards and into the surrounding nature reserve. HOUR AND A HALF NATURE TRAIL: – Extension of the One Hour Trail, including a view point stop.